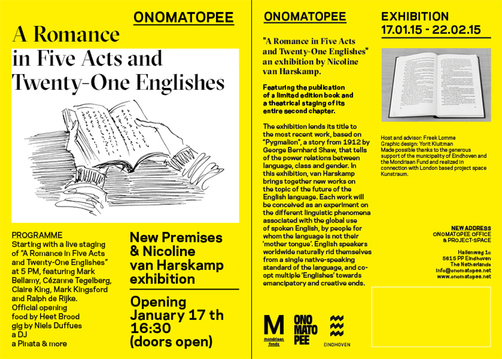 Saturday the 17th of January, Onomatopee will launch the limited edition book by Nicoline van Harskamp "A Romance in Five Acts and Twenty-One Englishes", and open an exhibition of recent works, both at their new premises in Eindhoven. On the occasion, between 5 and 6 pm, the entire second chapter of the book will be staged live by 5 fabulous actors. You are most welcome to join! Do spread the word! The book is a stopover on the way towards developing Nicoline van Harskamp's feature film debut "Englishes". Within the development of "Englishes" fall among others her recent exhibition at Kunstraum London, 25 October - 6 december 2014. Nicoline van Harskamp’s exhibition at Kunstraum included three new works, filmed and recorded in very different contexts: at UCL, London during a conference on English Phonetics in August; on the remote island of Färö in Sweden in September as part of a residency with Baltic Art Centre; and during an eight-hour live translation event at Kunstraum, London last Saturday. The works take the form of language experiments, in which participants from around the world test the possibilities and unique character of spoken language. A staged performance where text is controlled by the human body: Modest Doubt #4 by Bea de Visser in consultation with dancer and choreographer Jean-Guillaume Weis. This project is supported by the Materiaalfonds and the municipality of Dordrecht in the Netherlands. Turn, scenario for a feature film by Bea de Visser. Prematurely stage of development. Details to be expected end of January - February. Anotherfilm looks forward to film projects thought of beyond the horizon of film, visual arts, design, literature, sound and performance.